Since time immemorial, climate variability and change have triggered natural disasters and climate extremes causing heavy losses of life and property, forcing civil society to "learn to live" with these calamities. Floods, droughts, hurricanes, storm surges, heat waves precipitating wild fires and such other natural calamities have claimed more than 2.8 million lives all over the world in the past 25 years, adversely affecting 828 million people. Damage caused by these climate extremes during the same period was estimated at 25-100 billion dollars, dramatically affecting agriculture and forestry systems in regions where these have occurred. 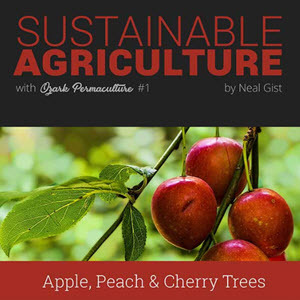 Agricultural and forestry production is highly dependent on climate, and is adversely affected by increasing climate variability and anthropogenic climate change leading to increases in climate extremes. There is strong evidence that global warming over the last millennium has already resulted in increased global average annual temperature and changes in rainfall, with the 1990s being likely the warmest decade in the Northern Hemisphere at least. During the past century, changes in temperature patterns have, for example, had a direct impact on the number of frost days and the length of growing seasons with significant implications for agriculture and forestry. Land cover changes, changes in global ocean circulation and sea surface temperature patterns, and changes in the composition of the global atmosphere are leading to changes in rainfall. These changes may be more pronounced in the Tropics. During the course of the 21st century, scientific evidence points to global-average surface temperatures are likely increasing by 2-4.5 °C as greenhouse gas concentrations in the atmosphere increase. At the same time there will be changes in precipitation, and climate extremes such as hot days, heavy rainfall and drought are expected to increase in many areas. The combination of global warming will be superimposed on decadal climate variability, such as that caused by the Inter-decadal or Pacific Decadal Oscillation, and interannual fluctuations caused by the El Niño/Southern Oscillation and the North Atlantic Oscillation. All these may lead to a century of increasing climate variability and change that are expected to be unprecedented in the history of human settlement and agrarian activities. The main purpose of the United Nations Framework Convention on Climate Change (UNFCCC, 1992) is to reduce the growth of greenhouse gases. Article 2 of the Convention states that its ultimate objective is "stabilization of greenhouse gas concentrations in the atmosphere at a level that would prevent dangerous anthropogenic interference with the climate system." Figure 1. 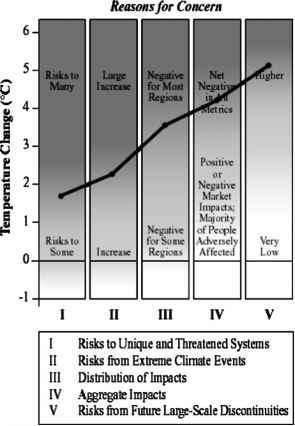 The risk of adverse impacts increase with the magnitude of climate change. Global mean annual temperature is used as a proxy for the magnitude of climate change (IPCC WG2, as modified by Mastrandrea and Schneider, 2004). The natural greenhouse effect keeps the planet and biosphere at an equable temperature for planetary processes to operate. The current rate of global warming is 2 °C per century, and this rate is projected as a lower range for the remainder of the 21st century. Thus, increases in greenhouse gases released by human activities are creating a potential situation where the stability of agriculture and forestry systems is threatened by dangerous climate change (Figure 1). Adapting to increasing climate variability then provides tools to reduce the vulnerability of agriculture and forestry. Some farming systems with an inherent resilience may adapt more readily to climate pressures, making long-term adjustments to varying and changing conditions. Other systems will need interventions for adaptation. Traditional knowledge and indigenous technologies should not be ignored. Age-old technologies such as planting calendars, intercropping and mulching reduce the vulnerability to climate extremes. However, the path of increasing variability and change will require the introduction of much more sophisticated technologies. Seasonal to interannual climate forecasting is a relatively new branch of climate science, and it promises reducing vulnerability. Improved seasonal forecasts are now being linked to decision making for cropping, developing climate risk practices to improve the application of climate information for the management of grazing practices, and developing climate risk practices to enhance the productivity and performance of forests. The application of climate knowledge to the improvement of risk management will increase the resilience of farming systems. Consequently, the occurrence of seasonal to interannual climate variability and their extremes can be forecast with a greater degree of accuracy. Availability of such crucial information in advance can greatly assist in taking effective measures for prevention and mitigation of losses by agricultural and forestry. Thus, the resultant disastrous effect can be reduced considerably through proper planning and more effective preparedness. Vulnerability associated with climate can be controlled to some extent by accurate and timely prediction and by taking counter-measures to reduce their impacts on various sectors of agriculture. One fact is for certain though - the historical record shows that our climate has changed in the past, and will continue to vary and change during the coming seasons and decades. The underlying theme of global warming is likely to cause increases in temperature and their extremes of heat waves, with climate scenarios of changing rainfall patterns as the 21st century progresses, with increasing extremes of floods and droughts. These will provide a challenge unparalleled in the history of civil society to agriculture and forestry: the papers in the this issue of Climatic Change assess the likely impacts of change and examine the adaptation and capacity building options to reduce vulnerability and increase resilience.